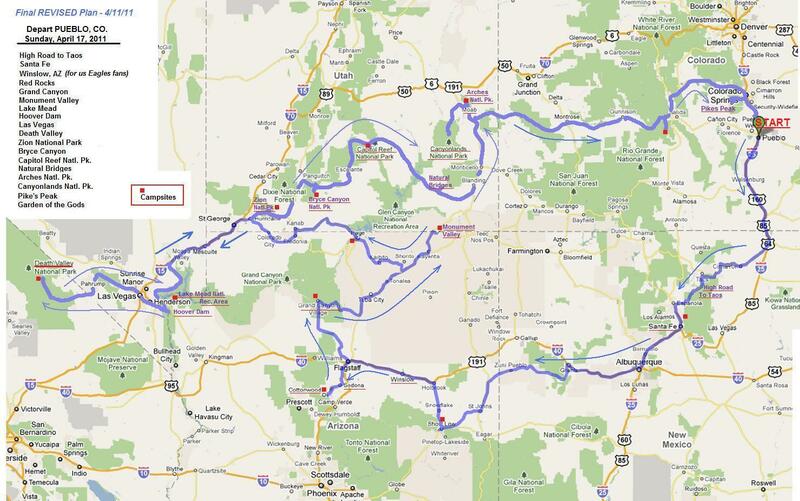 I was eager to get started on Day Four of my ride around the lower-left quadrant of the U.S. 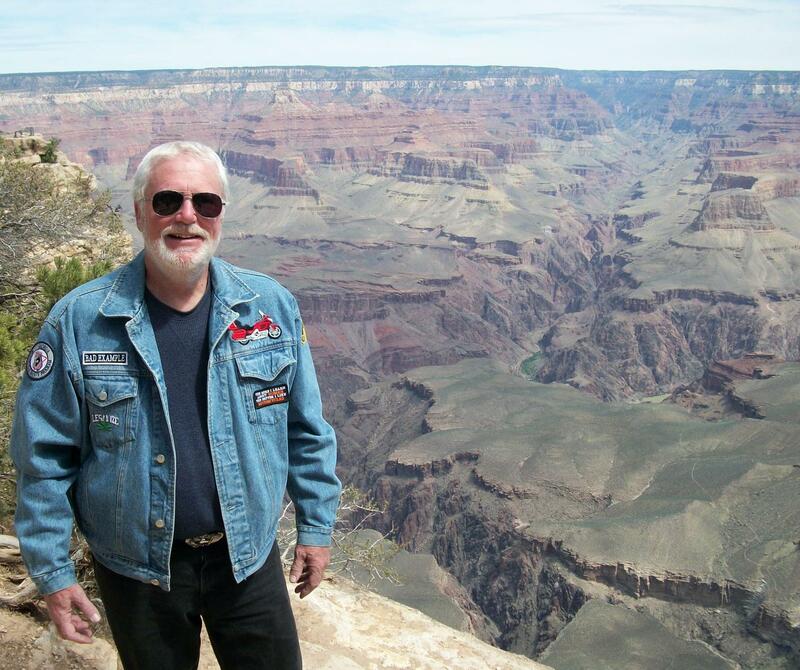 I had a fairly short trip ahead of me–just 130 miles–over some intervening mountains to The Grand Canyon. And I had a confirmed reservation for a campsite not far from The South Rim. I looked forward to spending this night (and the next night, too) overlooking one of the world’s natural wonders, one I had seen only from the air on flights to and from Las Vegas. North of Flagstaff: I got my first view of lingering spring snows in forests and fields at this elevation. 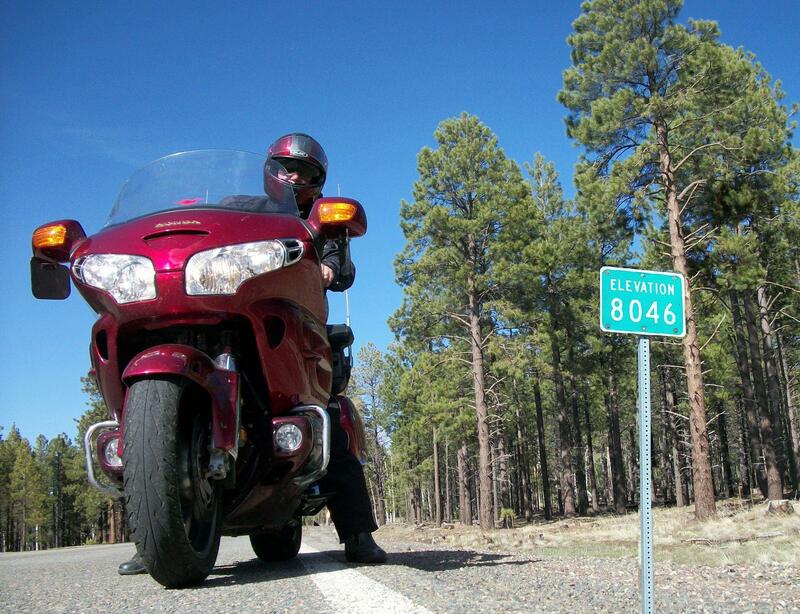 Riding out of Cottonwood, I watched the elevation markers register my steady ascent– more than a thousand feet by the time I re-entered Sedona and another 2,500 on the twisty canyon roads leading back through Flagstaff. Late in the morning I passed over the high point of the ride; it was also the ridge line that had protected me all morning from the harsh north winds. A fresh blow waited on the other side, and I was glad this would be a short trip. Again, I encountered a camping facility booked to capacity. In fact, the final tweak to my schedule had been built around the only reservation I was able to book here for two consecutive nights. And that was a full six weeks in advance. I was also greeted by brisk early spring weather. (We’re at 7,000 feet here.) The overnight temperature dropped to near freezing on my first night in the campground, and we heard it was snowing just eighty miles north at Zion National Park–my destination in the week ahead. I checked the weather band on my bike’s radio and learned that the second night on the rim was expected to drop to the upper twenties. My down filled mummy bag is rated by its maker for comfort at 20 degrees. I can’t tell you what a miserable bit of marketing hype that is. I slept in long johns (top and bottom) thick wool socks, plush velour over-socks, sweat pants, a waffle-knit shirt and a heavy sweatshirt, with a knit ski cap on my head. And I was able to achieve something like comfort. There is absolutely NO picture ever taken that can capture the immense and humbling grandeur of this location. There is no safety fence or guardrail behind me in this picture. Miles of the canyon rim are easily accessible to tourists. I’m amazed we don’t read about dozens of fatal accidents every year at this park. Clearly, the canyon’s five-million annual visitors–from all over the world–deserve a lot of credit for protecting their own safety. Most tourists come here to the South Rim; there’s also a vantage point on the North rim, a long ten miles across the gorge (215 miles by car). A couple of pages ago, on my route map, I indicated a plan to travel northeast from The Grand Canyon to visit Monument Valley and the Navajo Tribal Park at the Utah line. But in fireside chats with other campers at Grand Canyon I was impressed by their colorful descriptions of Death Valley and the insufficiency of my planned single day there later in my trip. Also, after a series of three one-night stands at the start of this tour, my leisure, two-day stay at the Canyon convinced me that I needed to slow down and smell a few more roses. And my campfire consultants were quick to point out that I was destined to see plenty of rock formations and desert spectacle at the other destinations along my route. So in order to buy some time down the road, I decided to forgo the northeast detour to Monument Valley and to head west, instead. I rode fifty miles due south from the Canyon to intersect my favorite wind tunnel–Interstate 40–and then turned west for 120 miles to Kingman. It was an afternoon ride, so I expected the worst, but I encountered no punishing winds. I ate a quick and early supper before turning north on U.S. 93, trying to beat the darkness to Hoover Dam, just 80 miles away. But the sun had long set before I breezed right by the dam without ever seeing it. (I’ll explain that unfamiliar experience in a moment.) I rolled into nearby Boulder City–where workmen lived for almost five years as they poured more than four-million yards of concrete into the dam construction project. It was too late to look for a campsite, so I settled in at a great, old, mom-and-pop (read that as cheap) motel. View from the new highway bridge bypassing Hoover Dam. 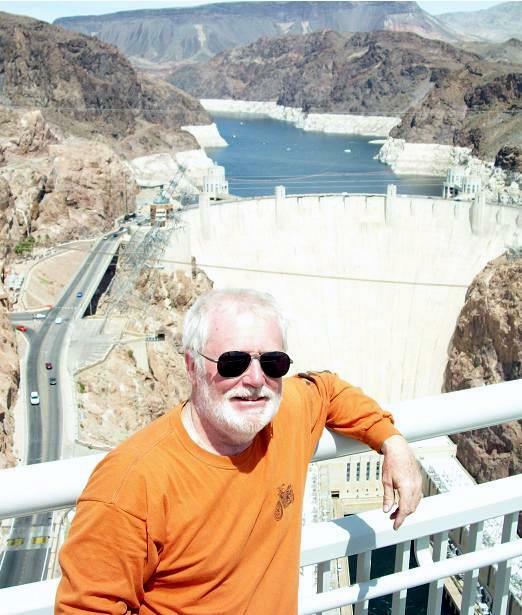 The next day was Saturday, and in the morning I retraced my route to visit Hoover Dam. 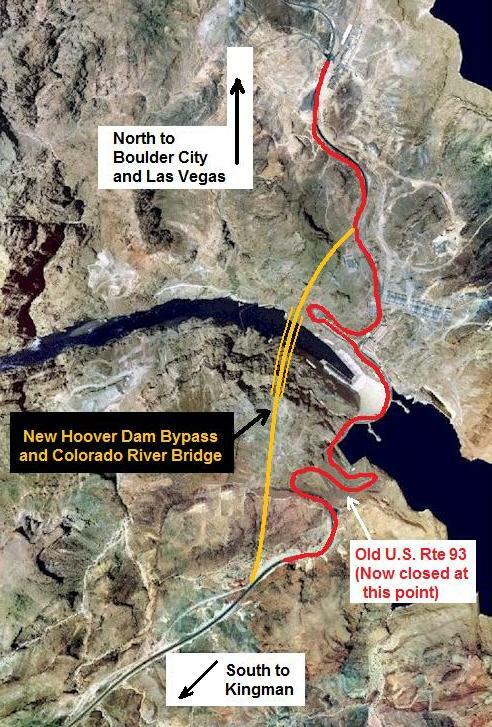 Years before I had followed the serpentine U.S. 93 (left in photo) from Las Vegas to cross the dam on the only route down to Kingman. I was surprised by how dramatically that has changed. Six months earlier you couldn’t get this picture. The Colorado River Bridge at Black Canyon (five years in the making) was not yet open. Now that it is, you can hike up to its pedestrian walkway, 1500 feet south of the dam, and shoot the kind of photos of the structure that were never possible before. When I rode across this bridge last night, the darkness and the tall railing kept me from seeing the colossal Hoover Dam. Notice the section of Rte. 93 just north of the dam–the section with the sharp hairpin curve that extends right under the new bridge. Now imagine yourself traveling south from Boulder City and just approaching the hairpin switchback. That means the dam is on our left and the bridge over Black Canyon and across the Colorado River is on our right. Click below to make that ride. Click here for a view of the new Colorado River Bridge at Hoover Dam. Before I left for Hoover Dam in the morning I had told the motel manager I would like to keep my room for another night. It was equipped with a fridge and microwave, I was comfortably settled in, and it was Easter weekend; I thought I’d take a holiday. As it turned out, I had stumbled into a fortuitous decision. After visiting the dam, I returned to Boulder City for lunch and decided to spend the afternoon in Las Vegas, just 25 miles away. I did the obligatory tour of the main drag through casino canyon, posed for a couple of touristy photos, and remembered all the reasons I’m not one of the big fans of Sin City. I thought I had outgrown Vegas in a half-dozen earlier visits to its gaudy strip, and riding it for the first time on a bike failed to give it any new appeal. It was on the ride back to Boulder City that I got the feeling something was wrong. As I took the ramp onto I-215, Scarlet displayed an uncharacteristic skittishness in her footing on the highway. Now that I focused on it, I could feel it clearly as I leaned the bike into each sharp curve or turn. When I got to the motel I gave Scarlet some time to cool down while I walked over to a grocery store, and when I got back I hoisted her up onto her center stand so I could spin her wheels and inspect her tires. Not good news. The rear tire was beginning to show uneven wear, called cupping. I’m sure I’d allowed it to happen by not closely monitoring tire pressure as I should have, and I doubt the side forces from days of crosswinds had helped very much. In any event this was not the tire on which to plan a further two thousand miles of riding. It would have to be replaced. Did I mention it was Saturday evening on Easter weekend? I cranked up my Toshiba netbook and accessed the motel’s WiFi network. Then I posted SOS messages on the two chat boards I enjoy most frequently. I explained that I was leaving the next morning for two nights of camping in Death Valley and would probably be out of internet and cell phone contact. I was surely out of luck for Sunday and Easter Monday, anyway, so I asked if anyone could act as my agent and book me into a dealership or service facility to have a new tire installed as I passed back through the Las Vegas area on Tuesday. It was asking a lot–tracking down the appropriate tire and booking a service appointment for a third party. But this is precisely the kind of off-the-wall experience that makes these websites so important to motorcyclists. Within a couple of hours I had a message from an administrator on the GL1800 Riders discussion board. 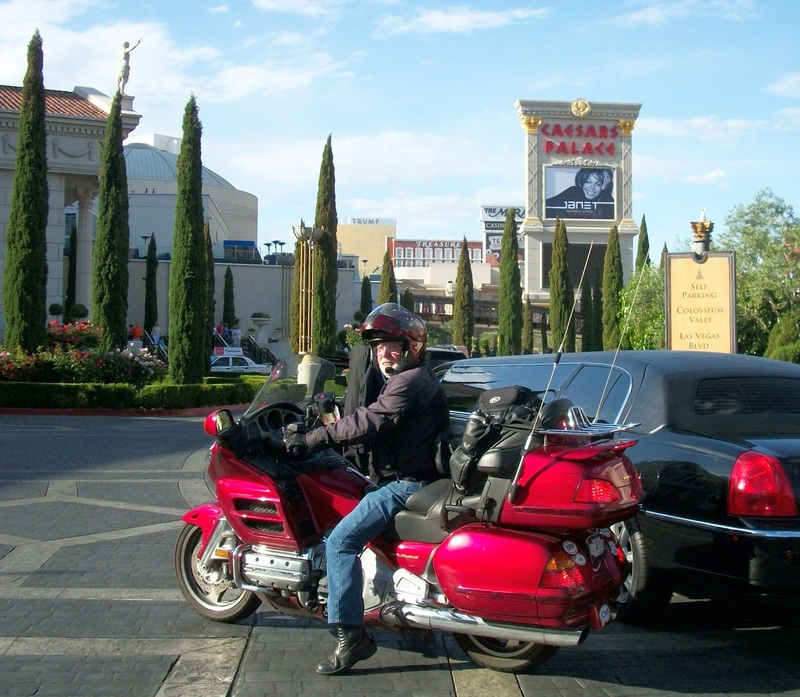 He was half a country away and couldn’t help, but he gave me a list of Gold Wing owners in the area, and he suggested that I call one of the group’s more active member who just happens to live in Boulder City. I got hold of Matt Sheen on Sunday morning, and that’s when the biker gods started to smile on me. 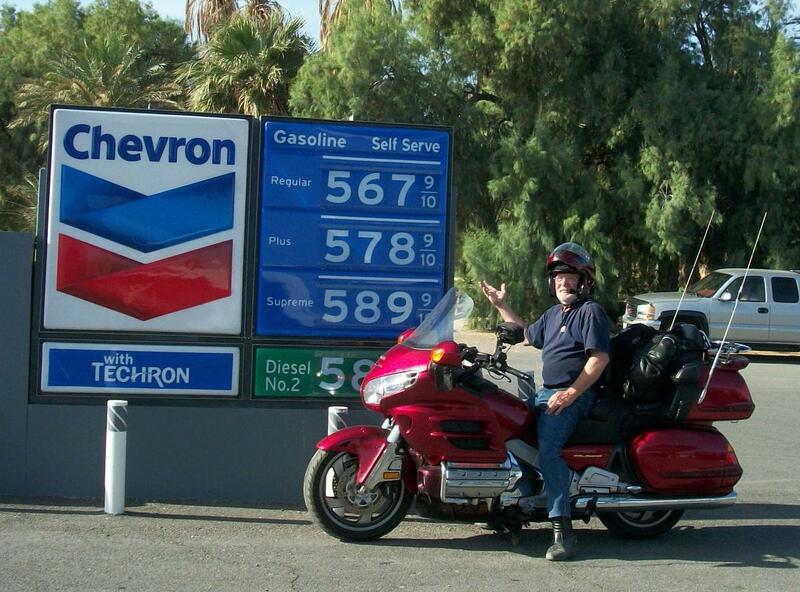 Matt had just recently removed a nearly new, rear tire from his Gold Wing as part of a new riding configuration. The tire was still at the service shop, and he would make arrangements for his mechanic to put the tire on my Gold Wing on Tuesday. He told me to go ahead with my Sunday trip to Death Valley and he would take care of the details before he, himself, left on a motorcycle trip the next morning, headed for Yosemite. He would leave voice mail on my cell phone describing the final arrangements. I was able to put the tire incident completely out of my mind for the next two days. I rolled out of Boulder City and looped south of Las Vegas for the short, 140-mile run to the land that God forgot. There were complex motivations in adding this destination to my itinerary. First, when Bryan Cady was describing his western trips to me, it was the mention of camping below sea level in Death Valley that stuck most vividly in my memory. There was a magic to the concept and a challenge in the notion of intentionally going–and staying–in a place bemoaned for its inhospitable and often deadly environment. And also I wanted to add California to the list of states I have been able to visit on two wheels. Back home in Georgia this would be a deer… or a duck. Almost immediately, the landscape around me started to take on new, wilder, even drier characteristics. 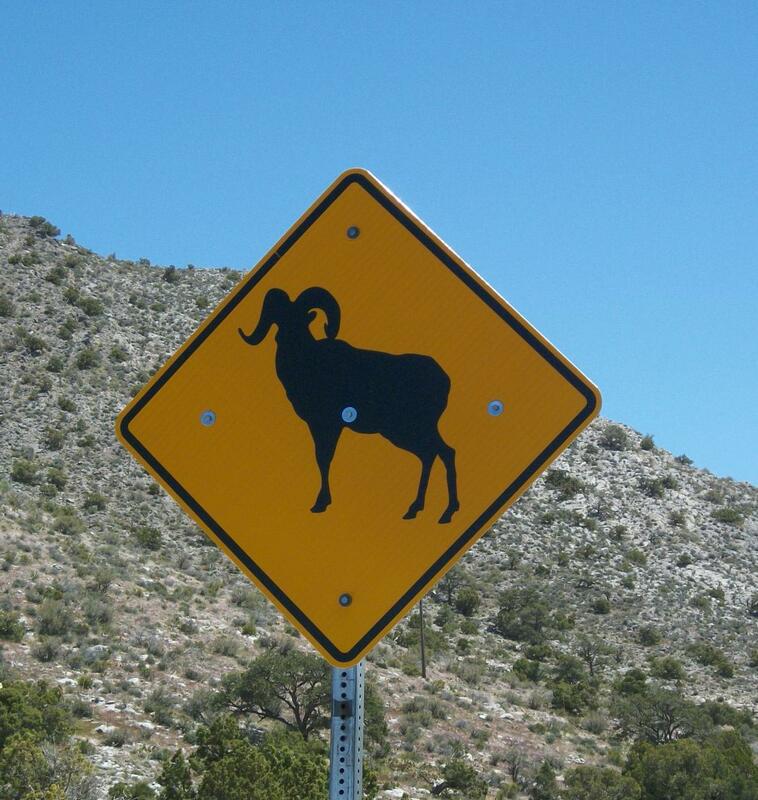 Crossing the spines of some rugged mountain ridges, the roadsigns reminded me that this was terrain I had never before experienced, and it was home to critters of sizes and shapes we don’t share space with back home. Mostly I was struck simply by it’s unwelcoming, unforgiving personality, an assessment that was reinforced each time I saw a warning that motorists should not wander off the marked roadway. And it would get harsher still. REALLY!?!?!? Can it cost THAT much to truck in gasoline? 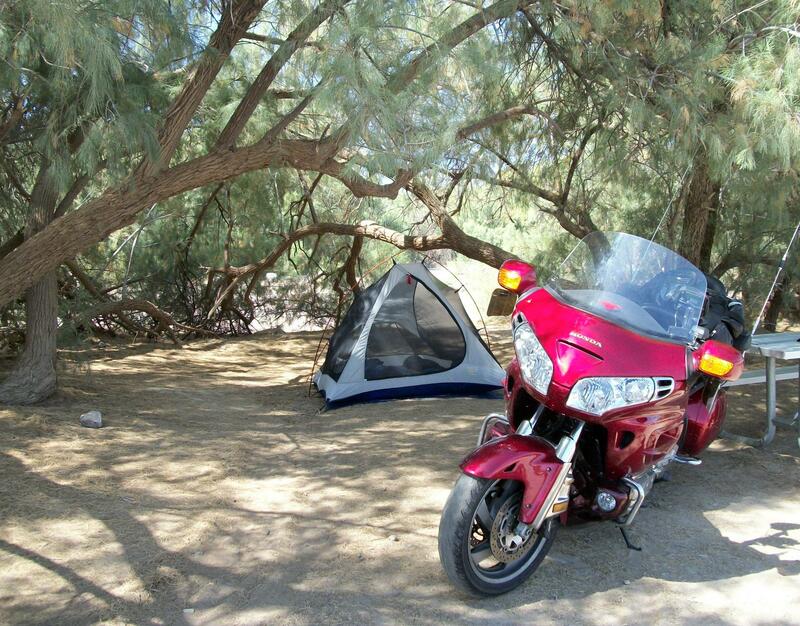 I had my choice of tent sites; I chose one with shade from the brutal sun. I haven’t mentioned the Senior Pass I carry that’s good in all of the country’s national parks. It cost me ten bucks, and it’s valid for life. It gets me free admission (which can run $25 in many parks) and fifty per cent off on campsite rentals. I paid ten dollars a day at Furnace Creek; I had paid the same paltry rent at Grand Canyon, and I would at Arches a week later. The previous two nights in my tent had been frosty events at Grand Canyon–before the motel break in Boulder City. And I would face more of those frigid temperatures later as I headed north, but the two nights in Death Valley were the best camping experience of the trip. I didn’t bother to put the rain fly on the tent, and both nights, as the desert breeze wafted through the mosquito netting, I went to sleep in shorts and T-shirt, lying on top of my sleeping bag. At about 4 AM, as the last of the daytime heat bled out of the dry air, I’d find myself burrowing under the covers to doze soundly ’til well past daybreak. I was glad I had taken the advice of fellow travelers and rerouted myself to enjoy the extra time at Furnace Creek. Riding in the valley is more spectacular than you might expect. Despite an arid sameness to all its sections, the landscape is spectacular in the harsh extremes it displays around every bend in the road. Again I have to confess that pictures just can’t do it justice. But if you click on the link below, you’ll get a tiny taste of the site’s desperate beauty. Click here for a day ride in Death Valley. On Tuesday I headed back to Las Vegas, and with luck, I’d be sleeping that night on the shores of Lake Meade, before riding north to the spectacle of Utah’s magnificent national parks. But first, I would check my voice mail to see what sort of tire replacement magic Matt Sheen had been able to weave for me before he hit the road to Yosemite. You can read the rest of that story just ahead at Saviors from the Chaos. Nothing worse than to have tire problems on a GREAT adventure. Love this trip report!